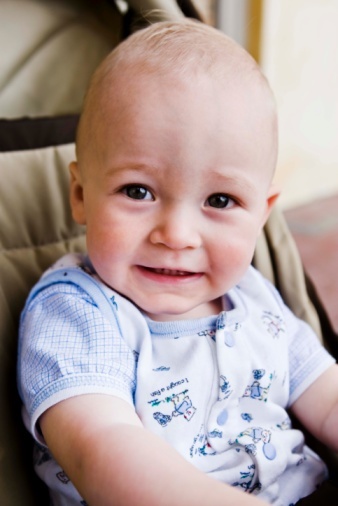 Bumbo seats are infant seats designed to help your baby sit upright without your assistance. Bumbo seats have an available tray attachment, which can help secure your little one in the seat. When you use it regularly, the seat will need to be cleaned frequently, like any other product your children come in contact with. Proper cleaning will protect the seat's finish and remove the germs and bacteria that can come along with kids' messes. Mix a small amount of dish detergent in warm water, enough to make a soapy solution. Soak a clean cloth in the solution and wipe the seat down completely with the cloth. Rinse the soap solution off the seat with running water. Dry the seat thoroughly. Remove ink and similar marks from the seat with a small amount of rubbing alcohol on a clean cloth. Scrub the marks to remove them. Wash the seat with a soap and water solution after to remove the alcohol. Clean the seat regularly with all-purpose disinfecting wipes to eliminate any residual bacteria.